I've been busy scanning some old car adverts from my huge collection of old magazines. There are loads more to come, and you can find them all here in my Flickr gallery. It's amazing how times have changed. Nowadays speed and performance is only subtly implied and never directly mentioned. You'd certainly never get a headline like that of the Mk1 Astra GTE advert, or a table of comparative 0-60 times showing how much quicker a car is than its rivals, as in the Strada ad. Nobody mentions maintenance and running costs like in the Metro ad, and it's rare to see a car sold solely on the strength of the standard equipment in the way that the Lada Riva was. It's all about "image" and "branding" these days, all about how you'll be perceived as an owner by those around you and not about the car itself. As the car is seen more and more as a dangerous, polluting evil and less as something to be enjoyed and cherished the copywriters daren't talk of performance and speed any more. In the world of "safety" cameras, bus lanes, congestion charging, traffic queues and massive taxes on petrol it just doesn't seem appropriate. We, as a society, have gone from loving the glamour and performance to being ashamed of admitting it as it's just not "correct" any more. Ironically, our main motoring programme "Top Gear" has gone from being an utterly tedious consumer programme in the 1980s to an out and out celebration of the car and everything it should stand for and is frequently and vocally criticized as a result. The cars are faster, they handle better, they have equipment levels that just weren't feasible at any level 30 years ago, yet the adverts aren't allowed to portray it any more. 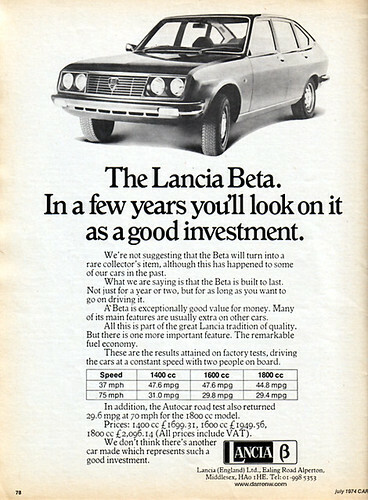 It's 1974, and the Lancia Beta is two years old. "What we are saying is that the Beta is built to last. Not just for a year or two, but for as long as you want to go on driving it". If only they knew what lay in store for them in the UK - horror stories of terminal corrosion, shockingly poor rust-protection and lots of media coverage of the whole thing which sowed the seeds for the demise of Lancia in the UK in 1994. They never recovered from the tarnished image. Rumours are that Lancia will be back in the UK in 2008. Time will tell if they prove to be a credible alternative to the German marques that currently rule the sports/luxury market. Would you believe it! After writing about how I'd never seen a Talbot Tagora, ever, I only went and spotted one whilst in Prague! There we were, the three of us, wandering from our hotel to the main town via the back streets of the City. I was busy photographing Trabants and Skodas for my galleries, when I spy a square roofline across a row of parked cars. Pondering for a second to think what it could be, it suddenly hit me. Next on my list: A Ford Cortina Mk4 "S" or a really early W-Reg Metro "S". Fingers crossed! I've spent the last week or so working on my eBay store. There is still a long way to go and a heck of a lot more products to add, but please have a look around! Apart from handbooks, manuals, brochures and other literature/automobilia, I'm developing a range of unique keyrings and fridge magnets (and coasters soon). Hopefully there's something for every retro-car fan, and they'll make ideal stocking fillers at Christmas time. If you're in a club then feel free to get in touch regarding items with your logo/branding on. Bulk orders welcome! If there's something you think I should stock but don't, let me know too! All enquiries welcome.